Home composting is the most environmentally-friendly way of dealing with kitchen and garden waste, plus it produces compost that can be used as an excellent soil improver. Composting is useful in all gardens. Only in the very smallest gardens will it be difficult to find space for a compost heap and material to fill it. Owners of such small plots could consider worm composting instead. Although councils offer green waste collections, the RHS encourages home composting because it does not involve heavy transport, with its associated environmental costs. Composting is done all year, as and when suitable materials are generated in the garden or home. However late summer to early winter is the peak time for making compost. It is important that the site is not subjected to extremes of temperature and moisture, as the micro-organisms (bacteria and fungi) that convert the waste to compost work best in constant conditions. Position the bin in light shade or shade; it is often more convenient to use a shady area of the garden. An earth base allows drainage and access to soil organisms, but if you have to compost on a hard surface, then add a spadeful of soil to the compost bin. Bins retain some warmth and moisture and make better compost more quickly, but even an open heap (not enclosed in a bin) will compost eventually. Any of the compost bins on the market should produce compost as long as they exclude rain, retain some warmth, allow drainage and let in air. Bins less than 1 cubic m (1.3 cubic yd) in size are much less effective than larger ones. The bacteria and micro-organisms that produce the compost function best when the balance of green and brown materials is correct. Avoid letting any one material dominate the heap - especially grass clippings, as these can become a slimy, smelly mess on their own. Kitchen waste and grass clippings are best mixed with brown woody material, as they tend to be wet and easily compacted, excluding air. Turning the heap adds air; air is necessary for composting to occur. If the heap is too wet or becomes compacted, then the composting process is slower as less air is available. Ideally, place a lot of composting materials on the heap in one go, and turn it periodically (perhaps every month) to introduce air. Failure to turn the heap is probably the main cause of poor results. Many gardeners are unable to fill the heap in one go, as they accumulate waste gradually. Because of this, home-made compost is seldom as perfect as municipal compost, but it is still effective. Remember to keep the heap moist in dry weather – turning will give you an opportunity to assess the moisture level. When is the compost ready? Garden compost can take between six months and two years to reach maturity. 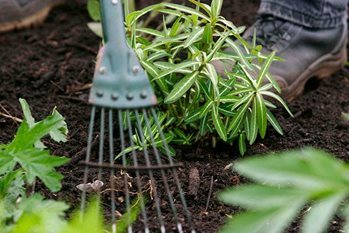 Mature compost will be dark brown, with a crumbly soil-like texture and a smell resembling damp woodland. It is unlikely that all the material in the heap will be like this, but any remaining un-rotted material can be added to the next batch of composting materials. Sometimes the results of composting are not as expected. Wet, slimy and strong-smelling compost: Too little air and too much water are often to blame. Cover the heap to protect against rain and add more brown waste, such as chopped woody material, shredded woodchip, straw or paper. Dry and fibrous with little rotting: Usually caused by too little moisture and too much brown material. Add more green waste, or try a commercial activator or accelerator such as ‘Garotta’. Alternatively, add fresh manure at one bucket for every 15cm (6in) layer of compost, fish, blood and bone fertiliser at 270g (9oz) per 15cm (6in) layer of compost, or sulphate of ammonia fertiliser at 140g (5oz) per 15cm (6in) layer of compost. Flies: Well-run compost bins don’t produce swarms of flies, but if you do see these, then make sure you cover kitchen waste with garden waste after adding it to the heap and check that moisture levels are not too high, causing insufficient air in the heap. Organic matter: what is it?